With the latest toolbar PageRank update behind us, I would like to take the opportunity to review the metrics that we make available for every publisher site and give you a few tips on finding some of the great values our publishers are offering. Whois Date – This is the registration date of the site. Older domains tend to have more links and therefore more authority. OBL (Out Bound Links) – This refers to the number of out bound links from other advertisers on the HPB marketplace. The fewer the OBLs the better. PageRank – This is the current toolbar PageRank as reported by Google. Keep in mind that toolbar PageRank only shows an approximation of a webpage’s PageRank at some point prior to the last toolbar update. Since updates tend to occur at roughly 3 month intervals, PageRank is not always the best or most current measure of a webpage’s authority. More on PageRank here. MozRank – MozRank is determined by the quantity and quality of other pages linking to a page. Like PageRank, MozRank is a logarithmic ten point scale. This means it is much easier to move from a MozRank of 2 to 3 than from 3.1 to 3.2. 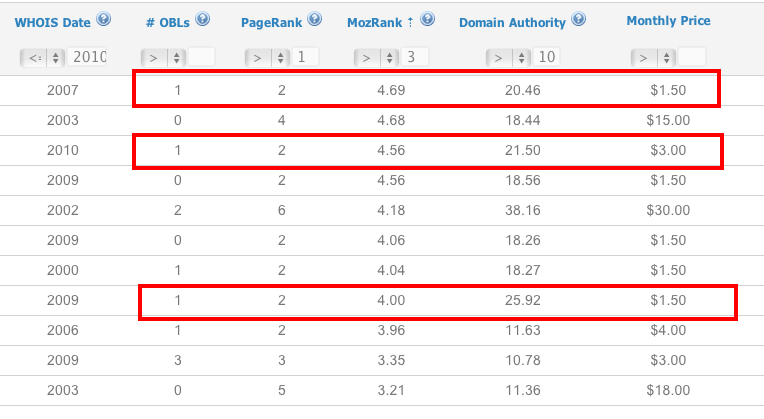 MozRank is one of several metrics that are measured by SEOmoz using data from their own index of the web, Linkscape. Domain Authority – Domain Authority represents SEOmoz’s best prediction about how a website will perform in search engine rankings. Both are measured logarithmically but on a 100 point scale instead of a 10 point scale like mR. These metrics are arrived at by using ranking information from the search engines and combining with data from the Linkscape index to form a predictive model. Compare the DA of sites in the same category to see which one has the most authority. Monthly Price – Always an important consideration when purchasing links, make sure you look at plenty of linking pages to make sure you are paying a fair market price. 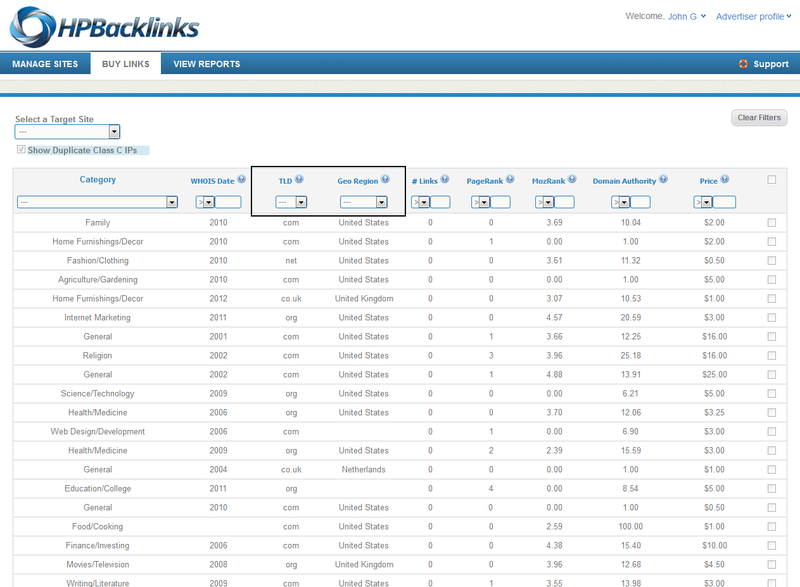 HPBacklinks does not place any limits on how much or how little a publisher can ask for a link but we do offer pricing guidelines and we also publish marketplace stats so you have an idea of the most competitive categories and can make an educated decision. In the examples below, the site that I am buying links for is a health related site so I am going to stick with sites that are in the Health/Medicine category since the context surrounding my link will be related to my anchor text, the post that will be written by an HPB writer, and the topic of my site. These are all factors that will make sure I am getting the maximum value for my link. I will only resort to the General category if I have already hit my link limit for the Insurance category. Advertisers are limited to 10% of the total inventory in each niche category. My first step is to set up some general parameters for the sites that will publish my link. I do this with the use of filters. I am a big believer in domain age, so I am going to start by setting the whois date to <= 2010. This gives me only domains that were registered prior to 2010. This narrows the sites available from 39, to a more manageable 26. 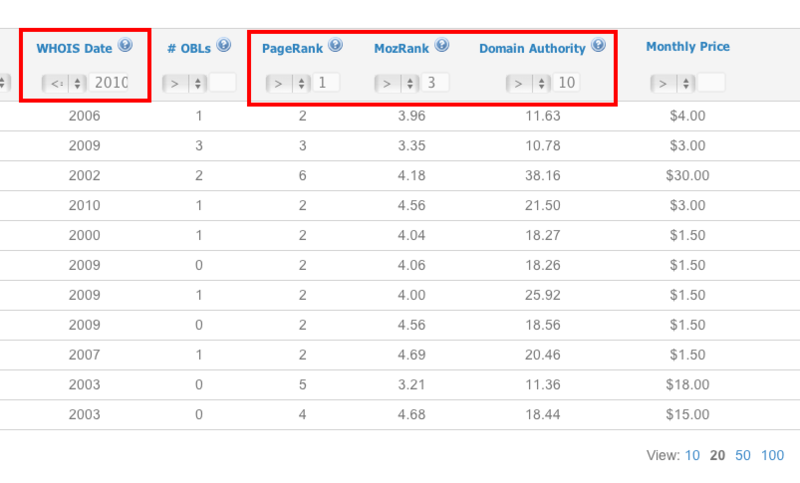 Next, I am going to set up some minimal parameters for PageRank, MozRank, and Domain Authority. 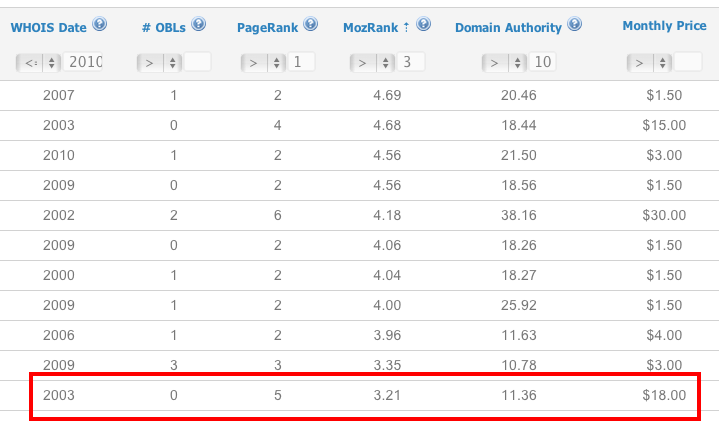 PageRank is not as important to me as MozRank or Domain Authority, so I set PR to >1, MozRank to > 3 and Domain Authority to >10. This narrows the field to just 11 sites. Now comes the fun part. Out of the 11 sites, I now want to choose the best link for the value. Right off, a few sites jump out as particularly good values. Personally, I like MozRank as an indicator for page authority, so I start by sorting by descending MozRank. Right away, I can identify some opportunities that far exceed my minimum requirements. 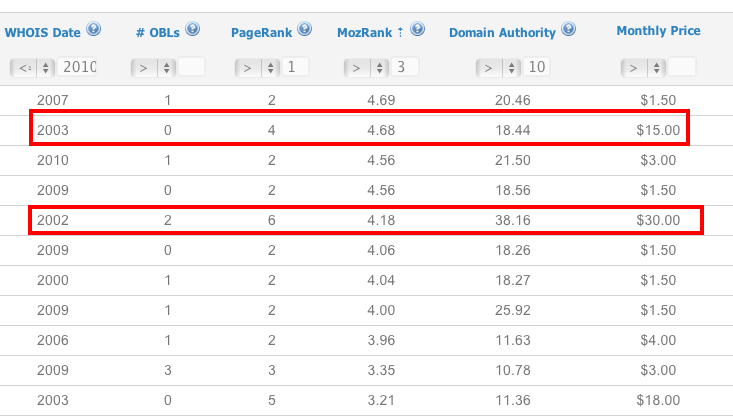 Since these sites have a low PageRank but high Moz metrics, the demand is lower that other sites with just a high PR. This is great for you, since you are much too savvy to be focused solely on PR right? I thought so. Granted, there are a few sites that have high PR in addition to great MozRank, but I can see that I will definitely be paying a premium for those. This site has very high PR but only an average MozRank and Domain Authority. At $18, I probably will not consider this site as a candidate. Hopefully this post will help you make sense of some of the metrics we provide and also help you get the most bang for your buck. As always, contact us if you have any questions about getting the most out of your HPBacklinks account.